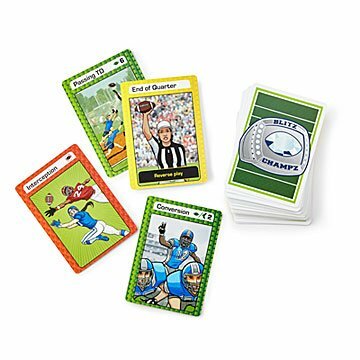 Score cool points with the kiddos (and sneak in some math practice) with this football-based card game. Parents, you're welcome: Here's a new way for the kids to play tackle football—and it doesn't even require a helmet. This fast-paced, easy-to-learn card game was created by a women's tackle football gold medalist, and incorporates football knowledge, strategy, and yep, sneaks some math skills in as well. Better still, it was designed with inclusivity in mind: The cards feature players of varying genders and races, so everyone who plays will feel represented. The game only takes about two minutes to learn, and you can finish a full round in 15 minutes. Players seven and up (hey, that technically includes grown-ups, too) will love it—a real winner at parties and tailgates, or rainy days spent inside. Made in Battle Creek, Michigan. Easy to understand and play. Perfect for parties and as a gift. Great tool to teach math skills in a playful manner.